Hey stampers! 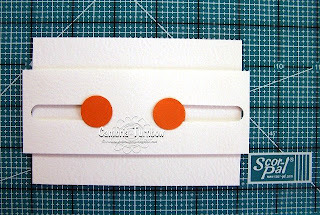 Here is the tutorial I promised for the Slider Gift Card Holder. I had some instructions from SCS by Amy (genescrapper). She wrote her version based on a card from Paper Crafts magazine. This is what I did to make my sliders..... you ready? ** You can click on the photos to see a larger view. Top Notch Die, Nesties, The Big Shot (for my front panel) and my Scor-pal and Scor-Mat. 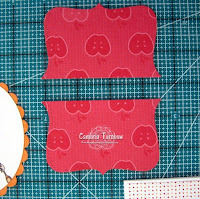 Add the designer paper to two of the four 2.75 x 4.25 pieces. Set aside. 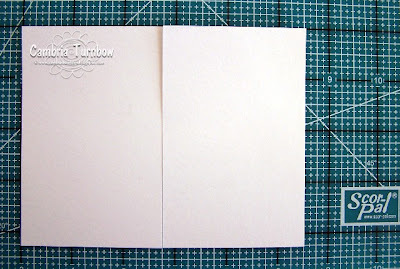 Step Three: Take the 5.25 x 2 piece of cardstock and punch out with your word window punch two slots on each side. 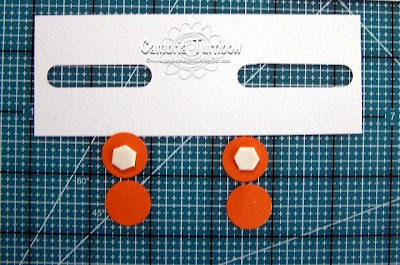 Step Five: Place the circles with the dimensionals under the slots you made with the word window punch. 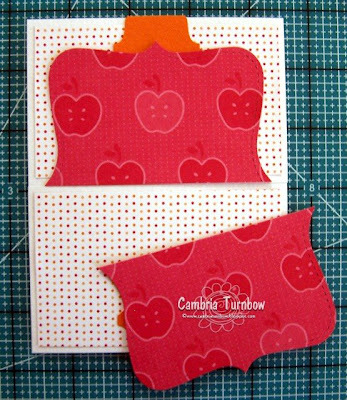 Peel off the backing, then stick the other circles on top to make a sandwich over each slot. Step Six: Add dimensionals to the center and each end. 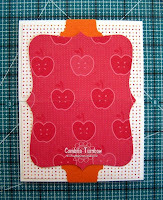 Step Seven: Peel off the dimensional backs and attach to the center your slider on top of your 5 x 3.5 piece of cardstock. 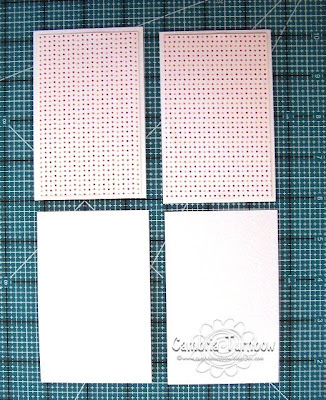 Step Eight: Center two of the four pieces of cardstock that don't have the designer paper on them on your Scor-mat so that they are straight. This is important to make sure that they are straight and close together. Step Nine: Add some Scor-tape on each circle on your slider portion. 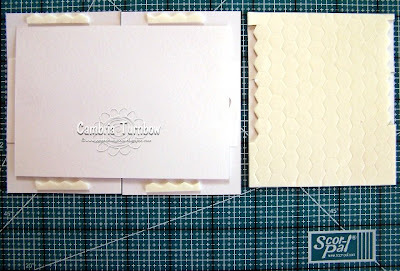 Peel off the backing and carefully center it onto your pieces in the in the above photo. 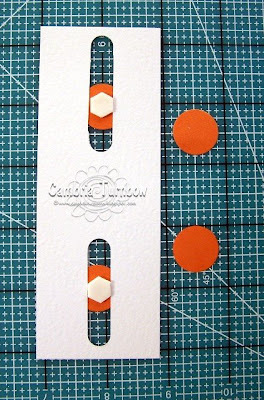 You should be able to pull on each end of your blank 2.75 x 4.25 pieces of cardstock and it will look like this. Step Ten: Add dimensionals to the top and bottom. The edges of the dimensionals work great, but you could use cut them in half also. Step Eleven: Slide out your pieces, peel off the backing on your dimensionals, then carefully center your two pieces with the designer paper over the dimensionals. 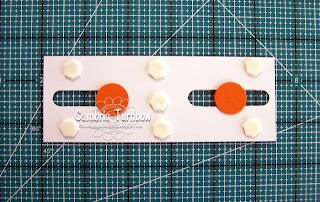 Step Twelve: Add your pull tabs and any other embellishments . You'll cut your center piece in half... or at least the main part that will be glued on the front. 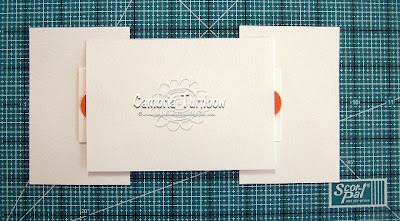 The designer paper is glued onto cardstock before I ran it through the Big Shot with the Top Notch Die to give it a little bulk. Step Thirteen: Make sure the slider is closed and lined up, then adhere your front piece one half at a time. Step Fourteen: Embellish the front. Add adhesive only to the top portion when you add it to the front. 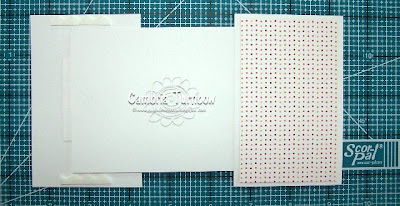 * After I opened this one, I decided to add more designer paper on the inside slider part. I just cut a strip and slipped it under. I didn't like the look of the gift card, so I turned it over to the flat side and added cardstock cut in the same shape. 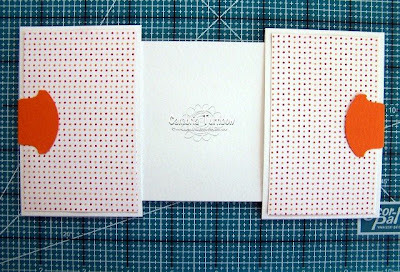 When the recipient pulls off the card, they will see the gift card side and the cardstock will just pull off the back. 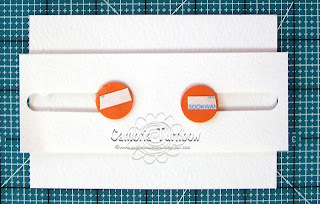 I used repositional adhesive on the gift card and to attach it on the slider portion. Wow.... this is a long tutorial. I hope it makes sense. 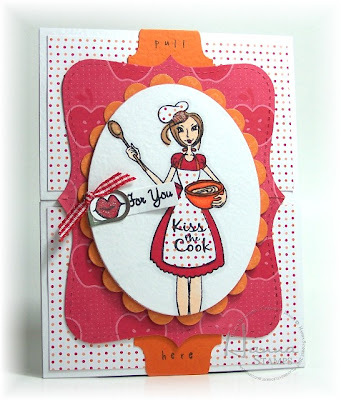 I think this would be a fun card for someone who loves cooking or someone who hates it too... you could include a fast food gift card. Of course I've added my little shazam touches with my Shimmerz Paint, paper piecing, and a little clip ( Clip Assortment from SU!) on the side that frames the lips. I added Pull and Here at the top on bottom tabs with my Snap Stamps. If you make a slider... 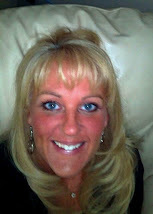 I'd love for you to share the link so I can see! Have a super day, and thanks for stopping by! What a neat project, thanks for the step by step! Thanks for the tutorial, I'm going to have to try one of these. TOO FUN! I love this - and AWESOME toot! You rock as always! I am so making one of these as soon as my SU order gets here! Thanks for the totally rockin tutorial, Cami. LOVE IT! a rocking tutorial, can't wait to give it a try. You are absolutely AMAZING my friend!!!! What a great gift card holder! Thanks so much for the tutorial - I'm already thinking Christmas!! Great tutorial! Thank you. Adorable card too. 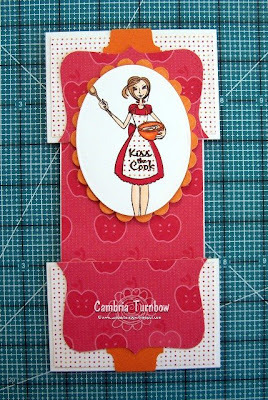 Love the card and the tutorial...I will be trying this one!! When the two pieces are pulled apart - one picture shows more Summer Picnic DSP (red apple) on the inside - did you add that piece over the white piece shown in the pics above? Also - where does the gift card go? Would I use the Slot Punch to make the holder and insert the gift card in the middle? Or did I misunderstand the 'gift card' part of the slider name? OKay, okay - dunce, doofus - whatever - it's me tonight! lol I got it figured out now - once I saw the first one you posted with the Just Jawing set. Wow Cambria! You're so smart and so cool! I wish we lived closer, because I would love to see your studio! Super job! 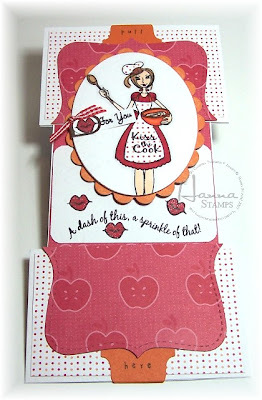 Congrats on your little shout out at Card of the Week for your cute creation! Love the colors. Thanks for the tutorial!! I have been wanting to make one of these, but just haven't even known where to start! Awesome card! This is such a cute and fun idea. Your turorial is so easy to follow. Great idea i will follow your instructions and make cards.